MedSLT is a multilingual spoken language translation system tailored for medical domains. The system is designed to help in situations where no common language between the diagnosing doctor and the patient exists. The patient answers by speaking directly to the system (bidirectional version). Currently the system supports speech recognition and translation for the headache, chest pain and abdominal pain domains. Supported languages are English, French, Japanese, Spanish, Catalan and Arabic. The project is financed by the Swiss National Science Foundation. 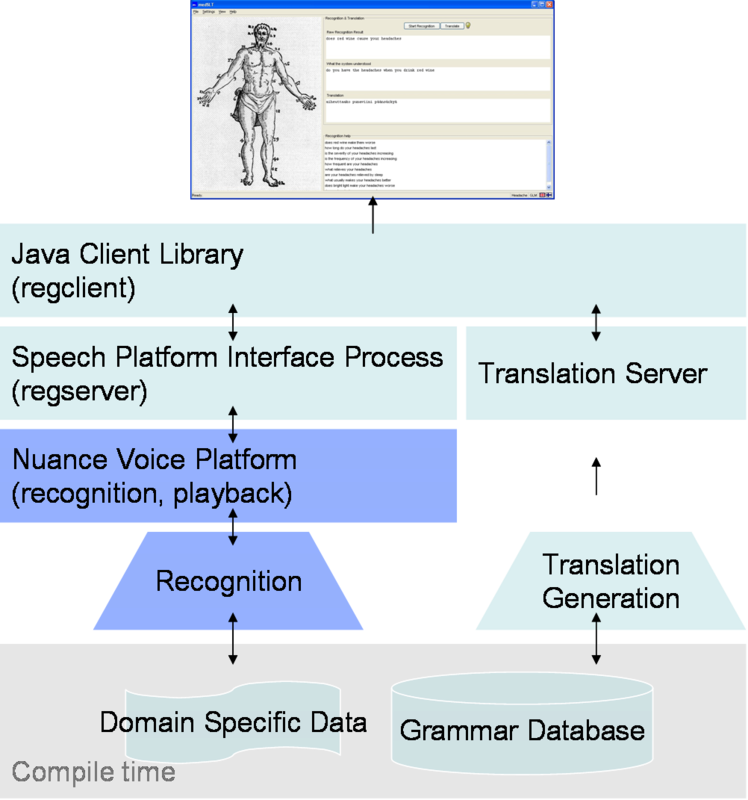 The diagram depicts Regulus compile and runtime components (green items) and their interaction with the NuanceTM Voice Platform (blue items). At compile time the Regulus grammar compiler reads in domain independent grammars along with application specific input files, and generates a recognition grammar. The recognition grammar is in turn compiled into a recongition package. At runtime the medSLT application creates instances of a platform interface process and a translation server. The translation server loads translation rules along with the generation grammar for the target language. The generation grammar can be compiled from the same domain independent grammar and corpus used for recognition.